There’s been some serious online buzz about the Oven-Fried Pickles I made a few weeks back. Of course, I loved them so much we had to make them again since then, so I can see why people are loving them so much. I’m beginning to see a pattern: vegetables + Panko = crunchy success! 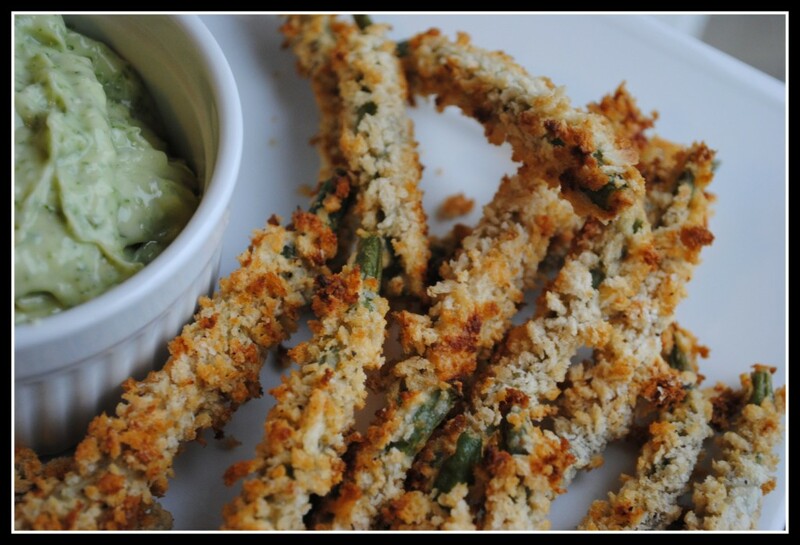 And then I Stumbled Upon a recipe for Green Bean Fries that also called for Panko breadcrumbs. Except they were fried in a vat of oil. Certainly that wouldn’t fly. With the oven-fried pickles still at the forefront of my mind, I figured the green bean fries could be backed to a crispy perfection. Ends up, I was right. My theory on vegetables and Panko holds true. Fill a large pan with 2-3 inches of water and bring to a boil. 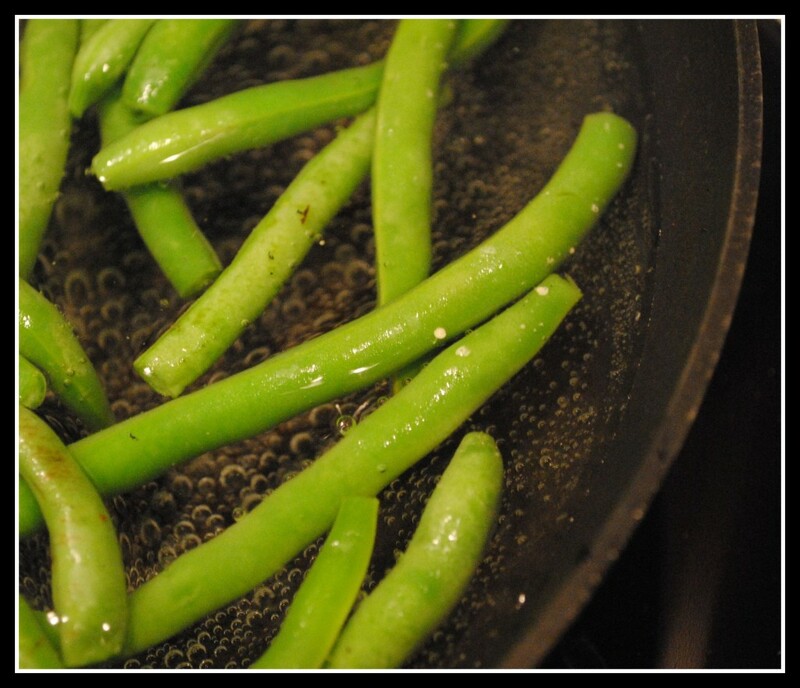 While water comes to a boil, trim the green beans. Prepare a large bowl of ice water and set aside. Blanch the beans for 3 minutes and immediately remove them to the ice bath. To prepare beans, gather three bowls. In the first bowl, combine the flour and spices. In the second bowl, combine the egg and milk, whisking to combine. In the third and final bowl, place the panko and season with salt and pepper. Remove 2 tablespoons of the flour mixture and whisk into the egg/milk mixture. Pat the beans dry and dredge in the flour mixture, then into the milk/egg mixture, and finally into the panko to coat. Arrange the beans in a single layer on a baking sheet lined with aluminum foil which has been sprayed with non-stick spray. Prepare all of the beans in that manner. Lightly spray beans with olive oil spray. Bake beans at 425 F for 15 minutes, or until slightly browned. Yield: 6 appetizer or side portions (about 10 green beans). 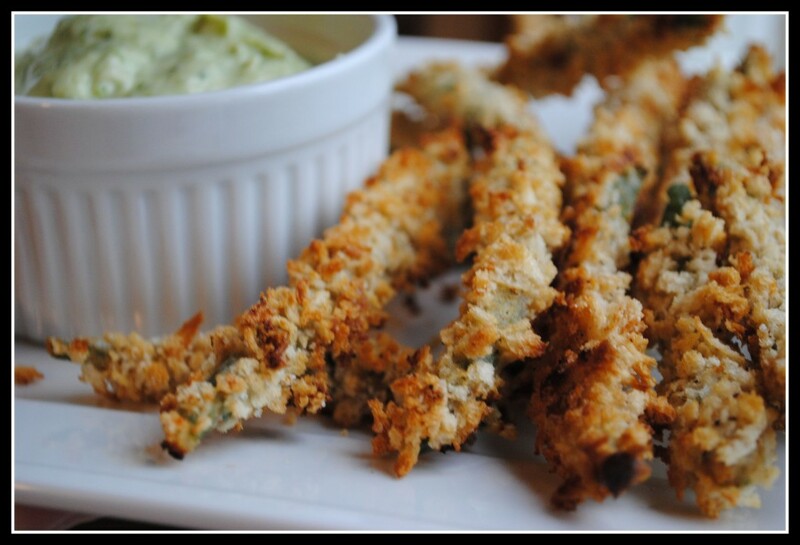 Result: Crunchy, light, and a fun twist on both a veggie side and traditional French fries. Mr. Prevention loved these, as well. Two thumbs up from us! Enjoy! So I had my green bean fries, but then came the predicament of what to dip them in. 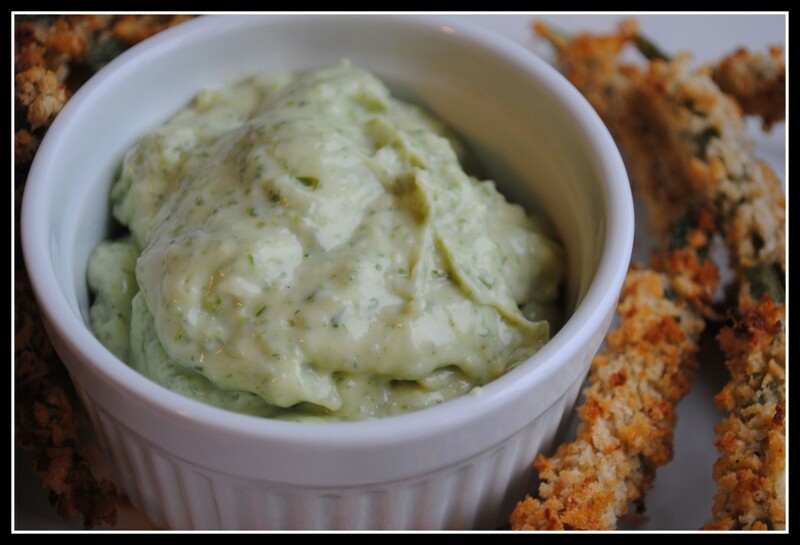 Wanting a change from our go-to light ranch dressing, I opted for a quick search through my recipe inbox and decided on a Basil Aioli. Process ingredients together in a food processor. Refrigerate until served. Yield: 9 tablespoons. Result: Creamy and flavorful and packed with healthy fat. The perfect dipping sauce for your low-calorie baked treat 🙂 This would also be great as a dollop on mashed potatoes, on meat, etc. Delicious! Enjoy! Question: What fried food do you love but wish were healthier? Mmmm…we had fried green beans the other night as an app at a bar, but they were SO heavy. These sound like a much healthier version! Thanks for the idea, I’m adding this “panko” idea to my wellness class on how to get your kids involved in the kitchen. Brilliant! Of course, I’ve still never used Panko, can you believe it?! I use breadcrumbs, but haven’t run out of my breadcrumbs and am too cheap to buy Panko before I run out. Next time though…Panko! I wish wings were healthier. I would eat them everyday. 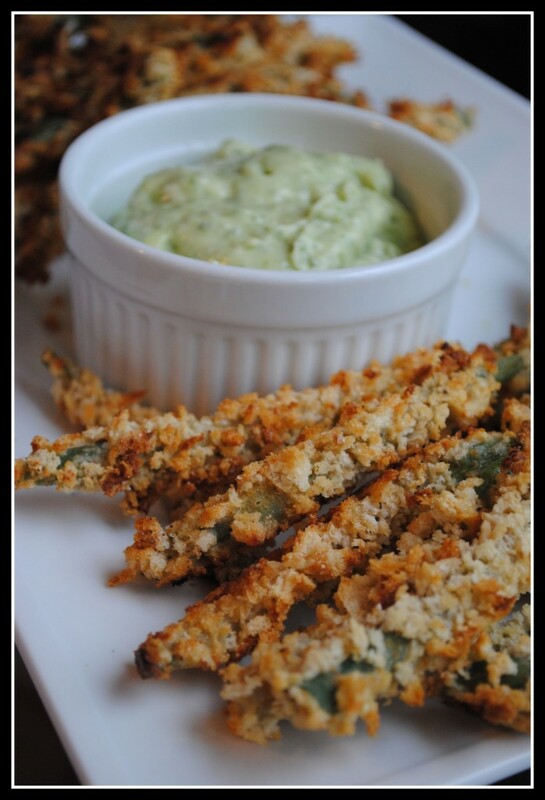 I love green bean fries now – but haven’t tried anything like this! This looks amazing. I love french fries and sweet potato fries – fried fish too! I need to try the fried pickles too – something for July. I hope you guys like the fries! Girl, you are genius! My hubby and I always split an order of green bean fries when we go to my favorite restaurant. I’m VERY glad to have a less indulgent option now! They look awesome— my Grandfather’s garden just made piles and piles of green beans. These are on the menu for next week now. By the way— received my food scale in the 2 weeks ago from your giveaway. It is a really nice addition to the kitchen. We’ve been weighing everything and my husband has been seeing nice results with his diet! Thanks again! Heather, that’s wonderful! You’re very welcome! I hope you guys enjoy the green beans! 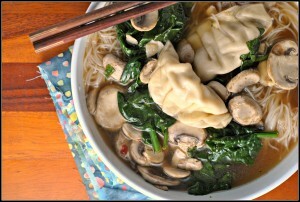 OK – so our town’s farmers market is tonight and I will so be making these for dinner. YUM. You rock…I have an entire grocery bag of green beans I’ve picked this week, and plenty of fresh basil!!! Making these as soon as I remember to get panko from the store! I never thought I would say this but…those green beans look delicious! They look awesome! My favorite fried food that I wish was healthier are french fries….but the good thing is that I actually enjoy baking the potatoes instead! Instead of feeding the baked green bean fries to kids, can I try it on my hubby? LOL! He’s not a fan of too many veggies but I bet he’d love this! LOVE! Hannah and I love the fried green beans at Friday’s – I am definitely putting these on the list of things to make – thanks Nicole! These look amazing! I’ll be trying these once my beans have fully grown! Yum!! I tried the “baked” fried pickles this weekend. Only my gluten-free bread crumbs kinda sucked and ended up making wadded corn balls. I need to try a different brand. I like faux fried foods at home because I can’t eat gluten filled fried foods out. Oh my goodness these look good. I knew there was a reason I needed to buy panko. These look great! We are in the process of moving but once we get settled this will be one of the first things I make! Good luck with the move! I know what a bear it is! I have now made two of your recipes in a span of 4 days, and have loved both! I made these tonight to go with turkey burgers, and they were fantastic! Alisha: Aw, thank you! 🙂 Glad you enjoyed the recipes! Making these right now and can’t wait to try them. I love how the panko crumbs stick to the green beans! I can tell that these are going to be delicious and healthier. Thanks for the recipe. They came out perfect and my husband usually isn’t the fresh green bean kind of guy, but he said they were really good! Sharing your blog with everyone on Pinterest! Thanks Nicole! Are these gluten free? 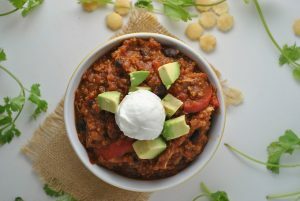 Are all recipes gluten free? Kaila, these are not gluten-free but could be with gf flour and gf bread crumbs/panko!